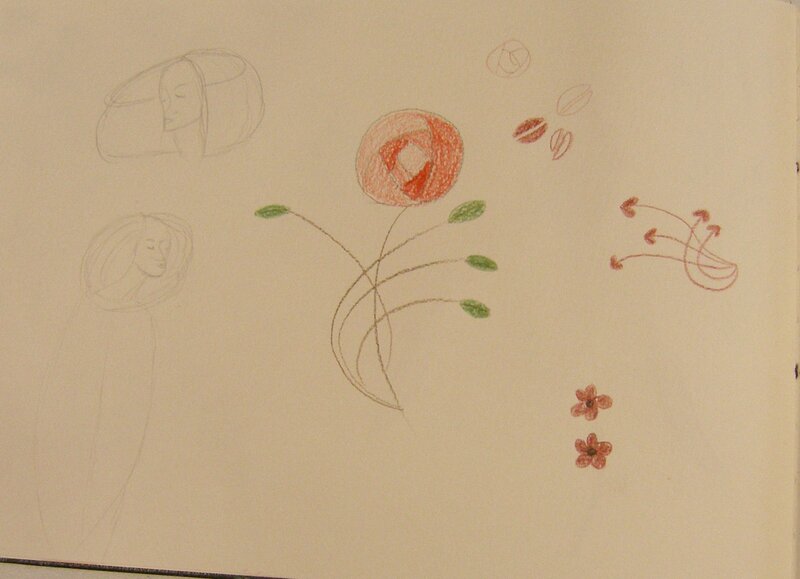 I’ve been so busy posting updates on my course work that I haven’t shown sketchbook work for quite a while. 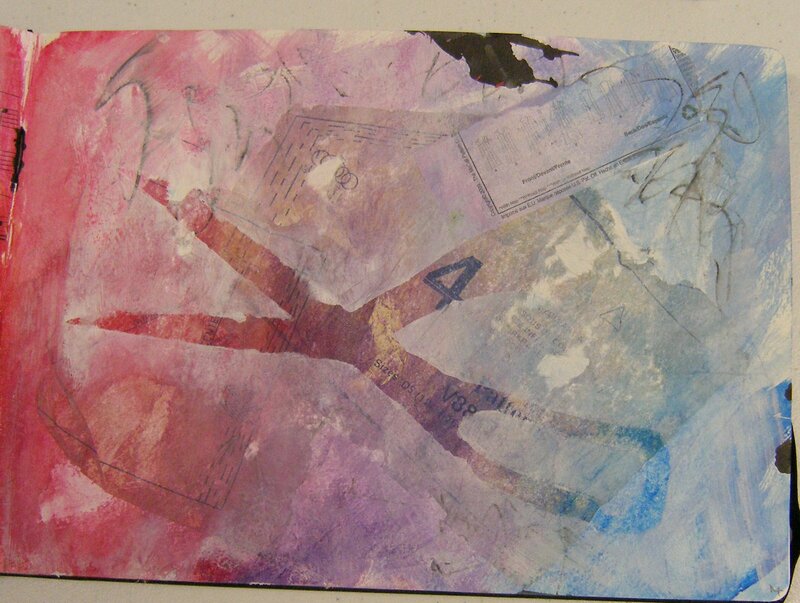 Here is what I have been working on. 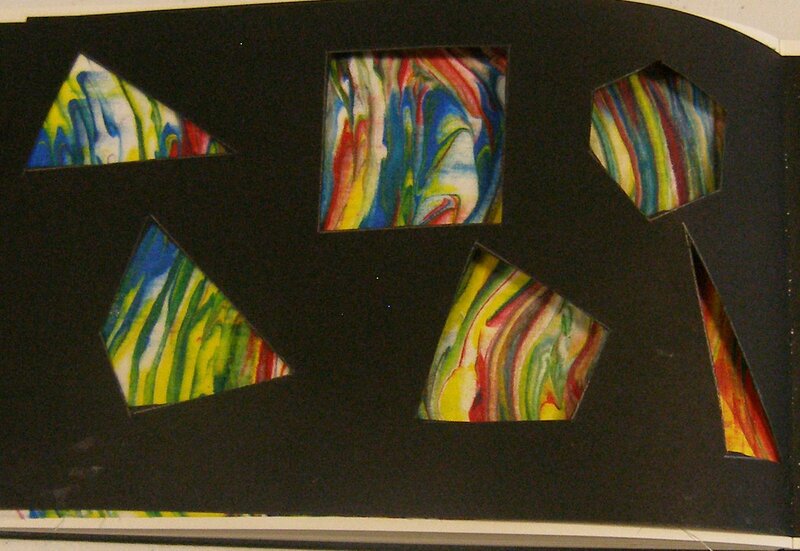 A piece of the fabric I marbled recently, with paper flaps either side with different cut outs. 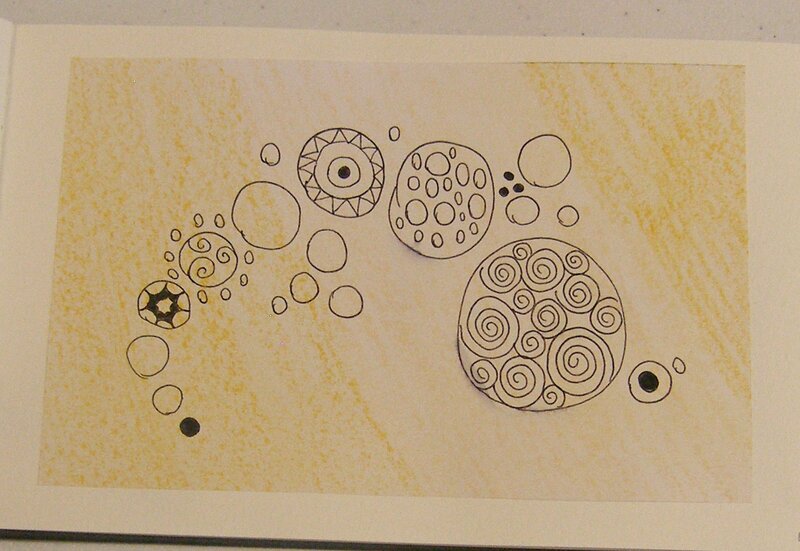 This could be used in fabric with cut outs and/or sheer overlays coming in from different directions. 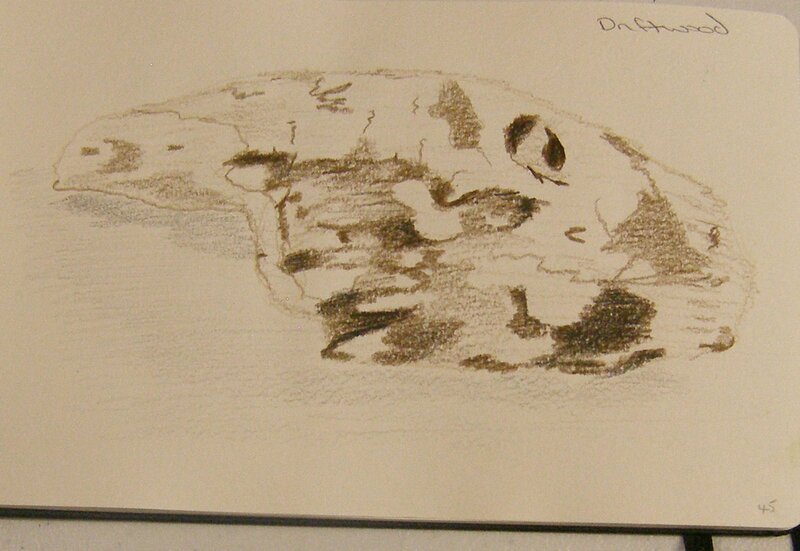 A piece of driftwood found on the beach. 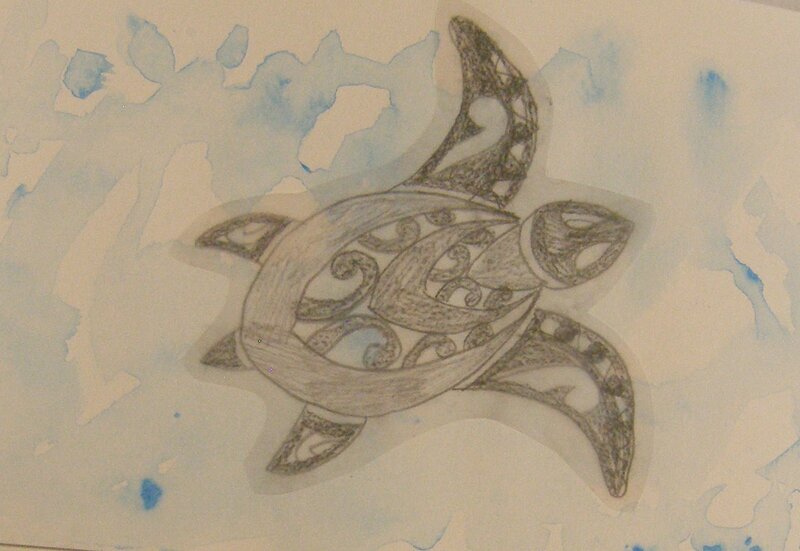 A turtle done on tracing paper and then glued onto a background with light watercolour. 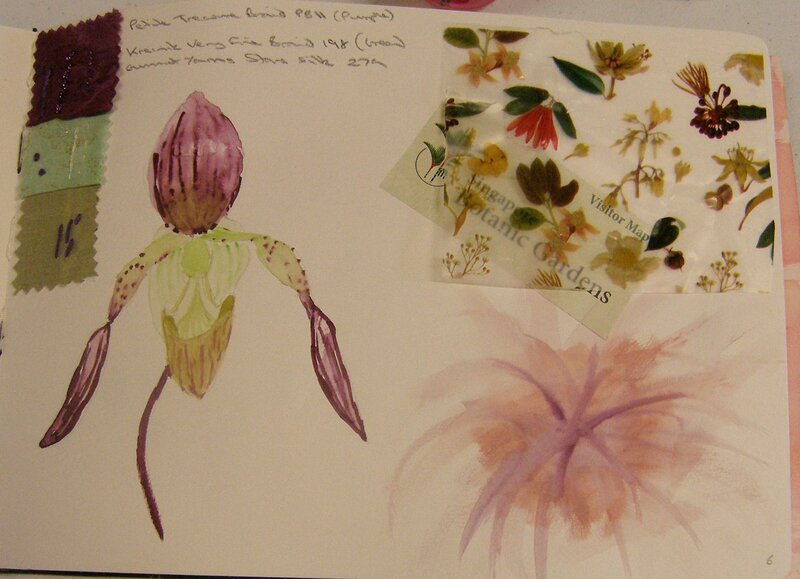 I have been doing more work in the larger sketchbook and feel quite comfortable working with this size now. 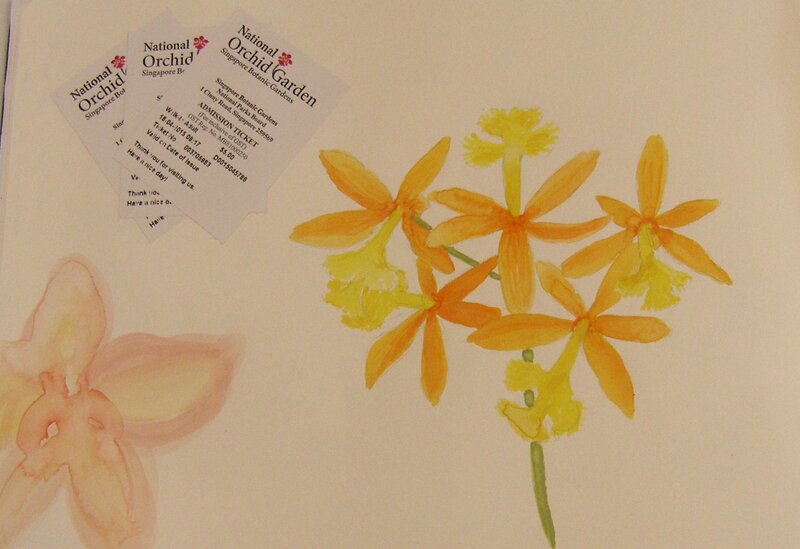 These first two were done after my visit to the Orchid Garden at Singapore Botanical Gardens. 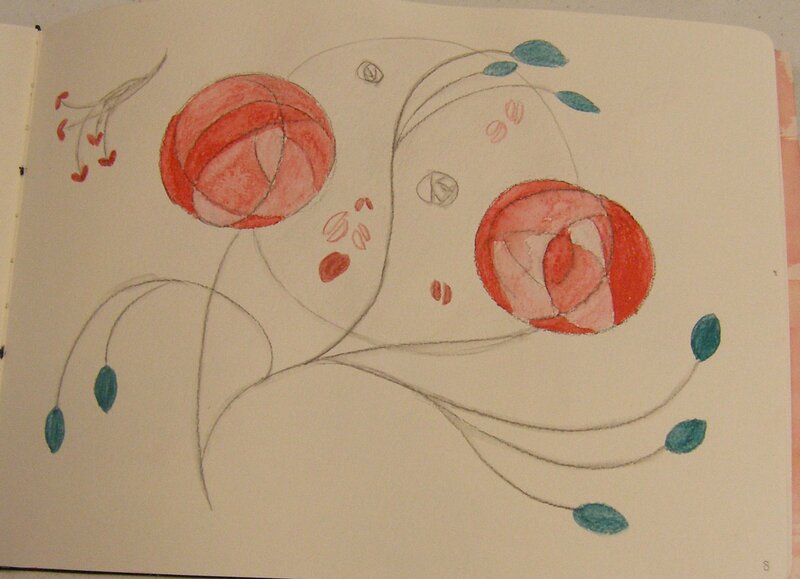 The next two pages are based on the work of Charles Rennie Macintosh – very iconic symbols of roses. 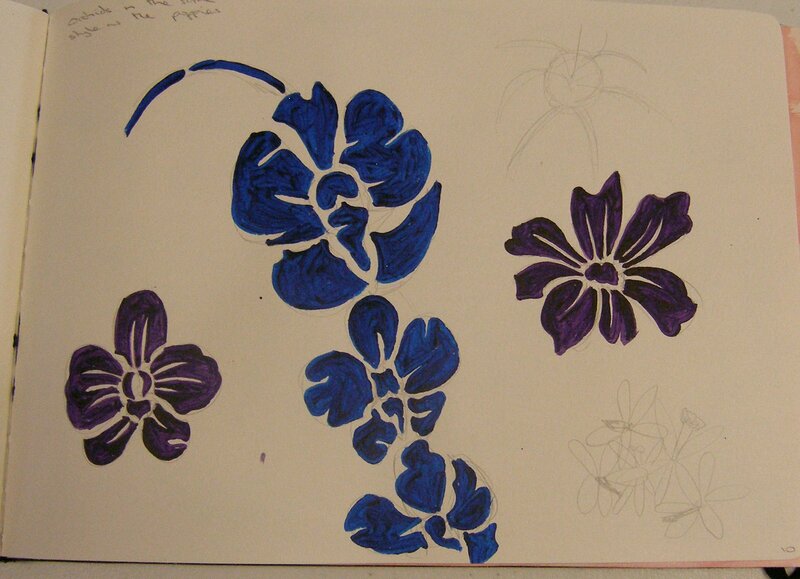 The red painting below is copied from a carrier bag from Poppy fabric and the blue version underneath is my own interpretation using orchids as the basis. 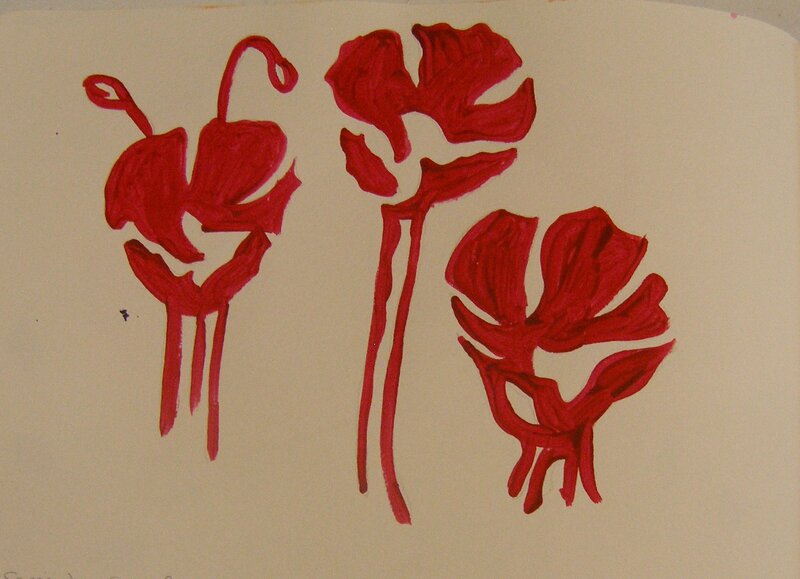 These would look good screen printed as they have strong, bold outlines. 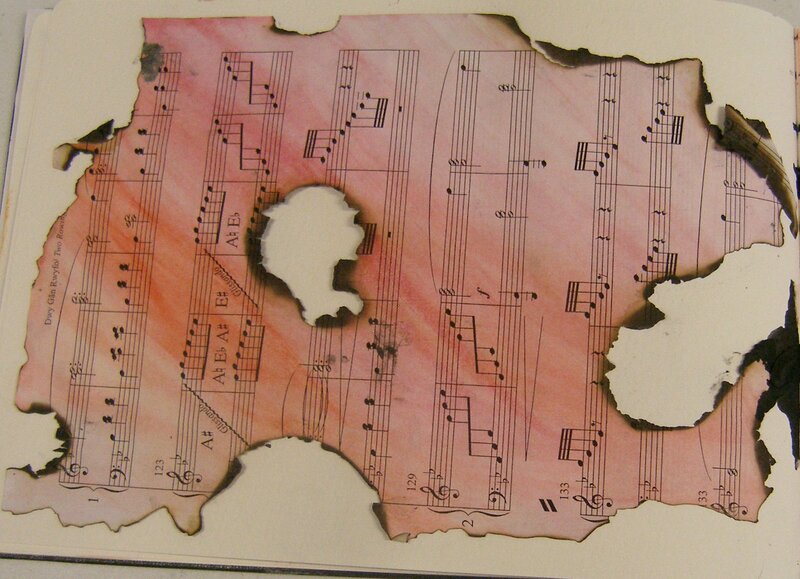 Another pair of pages, the first one was a sheet of music painted with watercolours and then selectively burned. 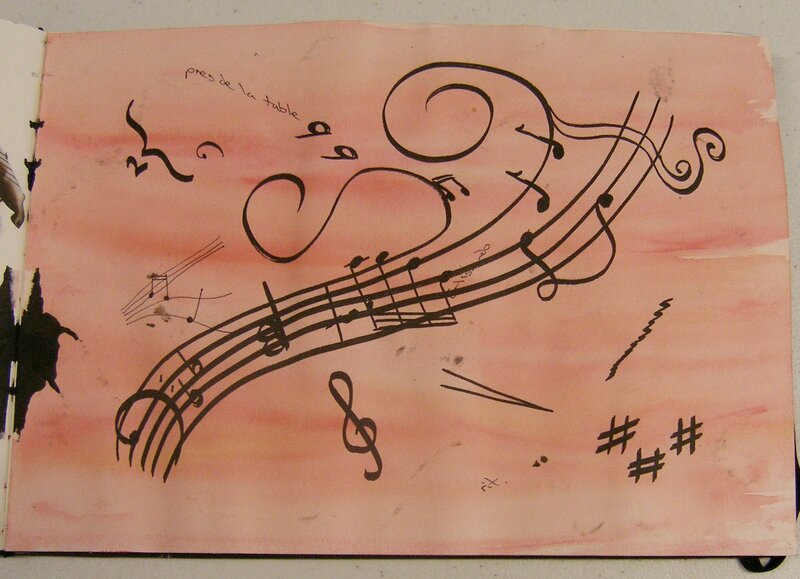 The second page was messing around with musical symbols. I feel the central motif of the musical stave that then splits off into different directions could be used in textile work; I can see this being stitched or even coming out of the fabric in wire to make a 3d piece. I wonder why I had a spate of working in pairs? 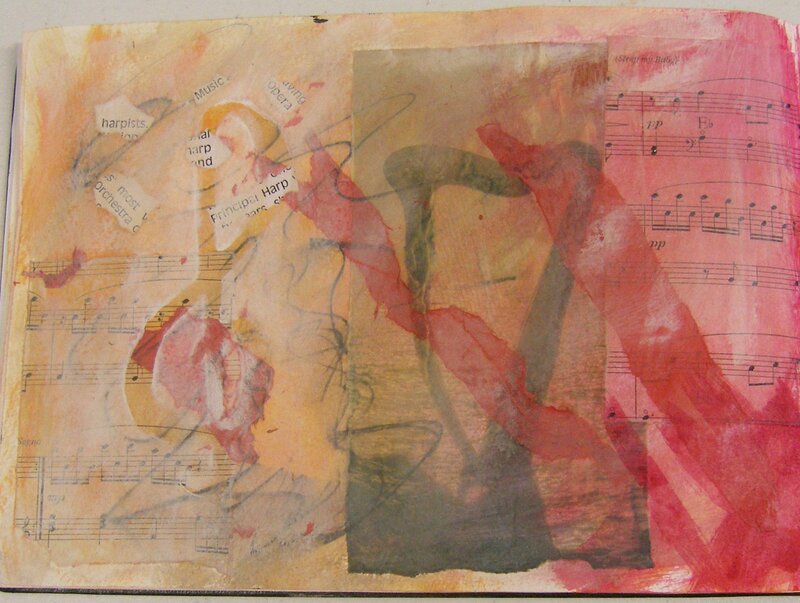 Here is another duo, this time with some collaged papers and pictures, layers of paint, some scribbling with black pens and overlays of gesso with areas masked off. These were really fun to do and very experimental for me. 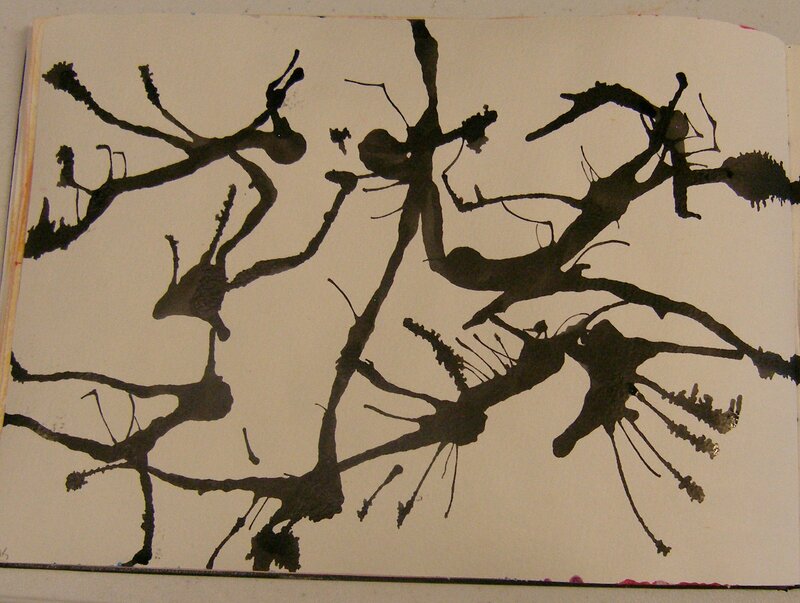 Ink splatters blown across the page using a straw. Wonderful lines like cracks in glass. 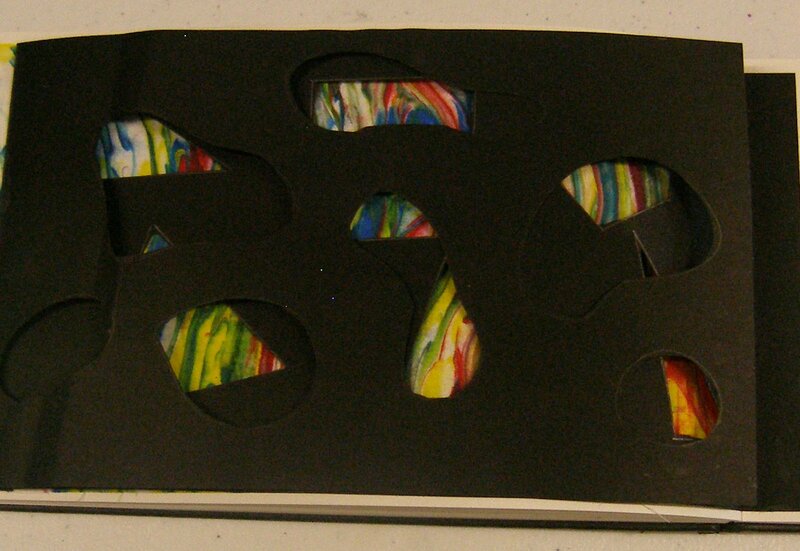 I pressed the next page onto the ink before it was dry and got some smudges carried over. 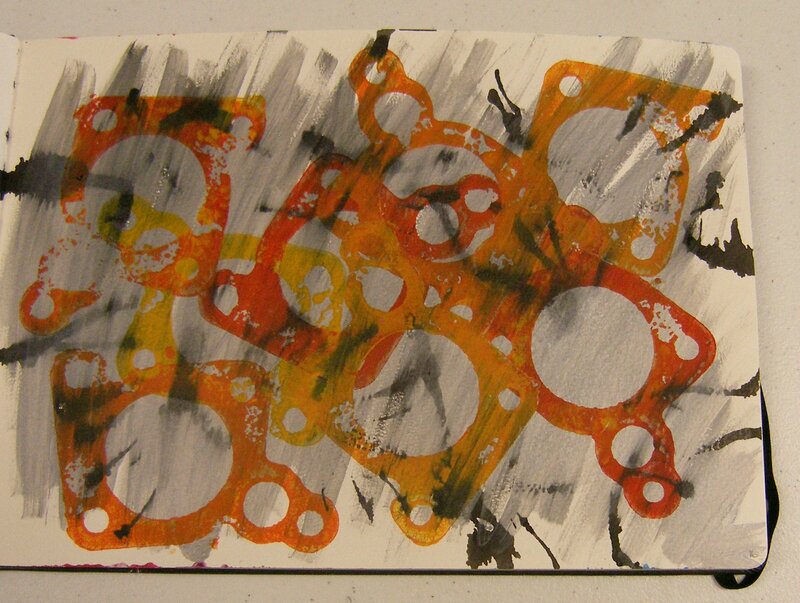 I washed over these smudges with a silvery grey paint and then when dry used some car gaskets as stamps. 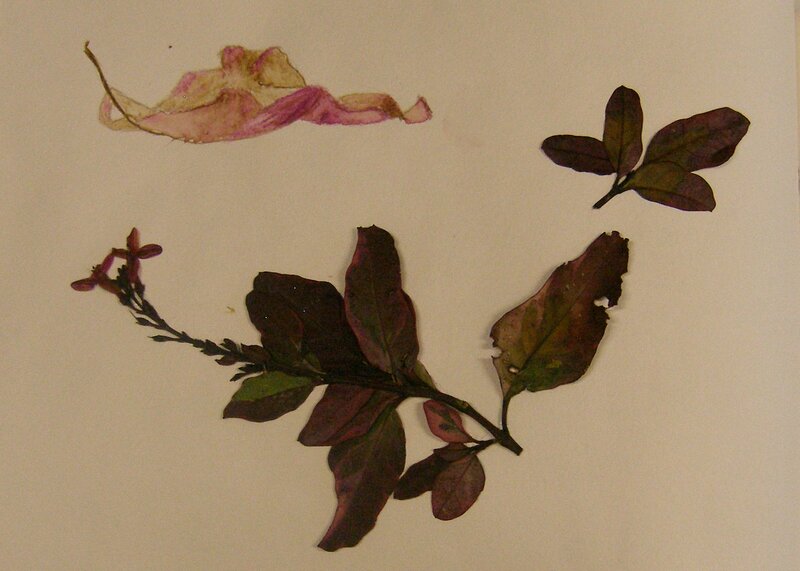 Just a single page this time, a pressed flower and leaves from the garden and a watercolour pencil sketch of a fallen leaf that was partially curled up and drying. The leaf shape reminds me of the experiments I did with Tyvek and I can image tyvek making very good leaves and other organic forms. 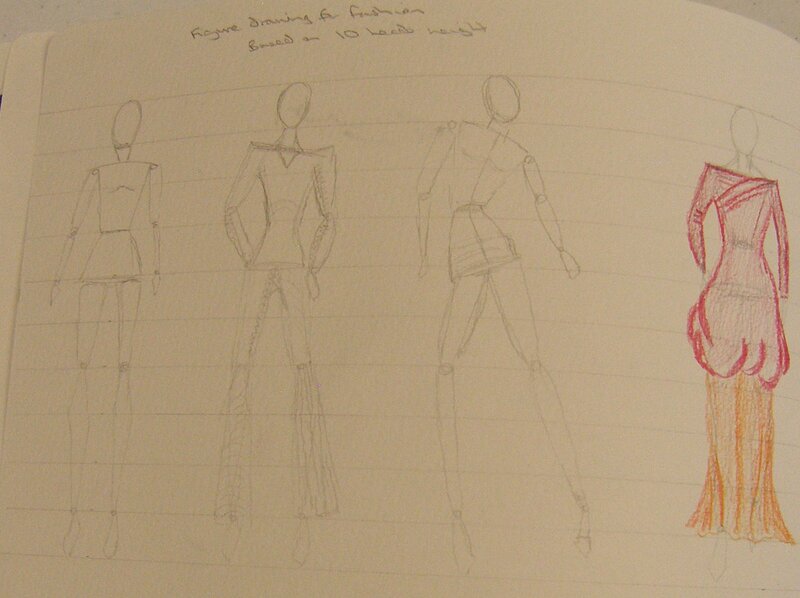 My last two pages were sketches where I was practising figure drawing for fashion. These models are based on 10 “heads” in height instead of the standard life drawing which normally uses 8. Fashion models have very elongated legs. I tried to get a sense of movement and also to get used to sketching an underlying frame to then dress with clothes. 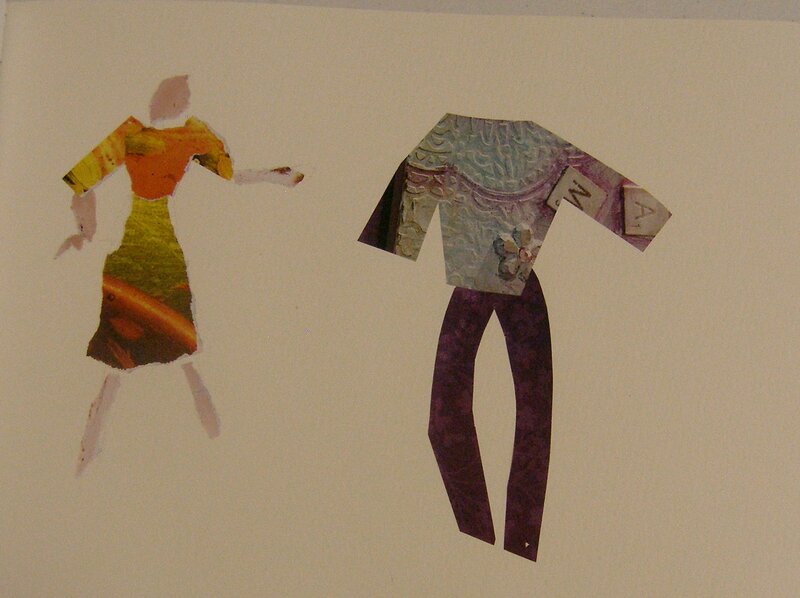 On the next page I used some paper to make collages.